Limited prints of landscape photography and beyond captured by me through out Oahu, Maui, Kauai, and Big Island. Waking up at 4am, driving for 50 mins, hiking for 20 minutes with all the photography gear - all that was completely worth it because at this exact location, watching sun rising over crystal clear turquoise water, i fell in love with Hawaiian landscape photography. Hanauma Bay has long been one of the island of Oahu’s jewels. Native Hawaiians have been enjoying life on the bay for thousands of years. The beach and surrounding natural park get their name from two Hawaiian words: “hana” which means bay and “uma” which means curved. To the Hawaiians, Hanauma Bay has long been part of their history. In fact, there are many legends about how the curved bay got its name. The bay was historically an excellent area for fishing. Records show that the Hawaiian royalty in the 1800s often stayed at the bay for entertainment and fishing. 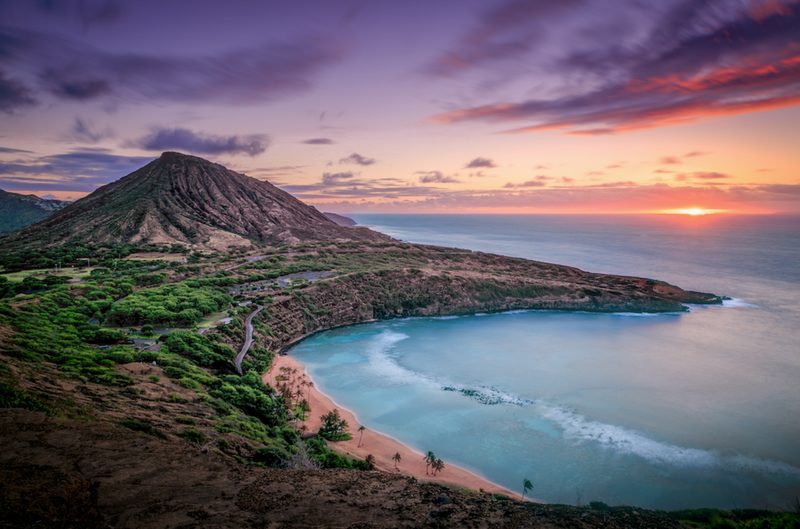 Formed within a volcanic cone, Hanauma Bay offers a pristine marine ecosystem and in 1967 it was declared a protected marine life conservation area and underwater park. The sunny Kona District stretches almost two-thirds of the entire West side of the island of Hawaii. North of Kailua-Kona is the Kaloko-Honokohau National Historic Park, a 1160-acre park that lets you explore early heiau (temples), fishponds and petroglyphs. Along this expansive area, you’ll find everything from coffee farms to historic Hawaiian landmarks. In fact, King Kamehameha actually spent his final years in Kailua-Kona. Other significant historic place includes Kealakekua Bay to the south, where Captain James Cook first set foot on the island in 1778 and where he was eventually killed. For just a few weeks these glorious fields (pollinated by local bees) dazzle the senses of thousands of spectators. Typically grown each year sometime between September and December, the life of these sunflower crops is short-lived as they are harvested soon after reaching maturity. The DuPont Pioneer sunflowers span 20 acres of prime Hawaii agricultural land amongst sweet onions, fresh corn and fall melons. Typically, the hardy yet joyous flowers take 45-60 days to bloom. • There are two types of sunflowers – ones that produce confection seeds for eating and sunnies that produce cooking oil. All of the sunflowers grown at the Waialua farm are for oil. • The most popular market for cooking oil sunflower seeds is in Europe, notably Ukraine and Russia. • One sunflower can produce up to half a cup of cooking oil. • Sunflower buds will follow the sun as it rises and sets, but once the flower blossoms it will only face east. • All money raised from the sunflower tour parking fee benefits: Waialua Bullpups Pop Warner Football Team, Waialua High School Girls Softball Team, Waialua Little League and Waialua High School Project Graduation. Turtles are one of the oldest creatures on earth. The Hawaiian Green Sea Turtle, known as “Honu,” symbolizes good luck, endurance and long life. 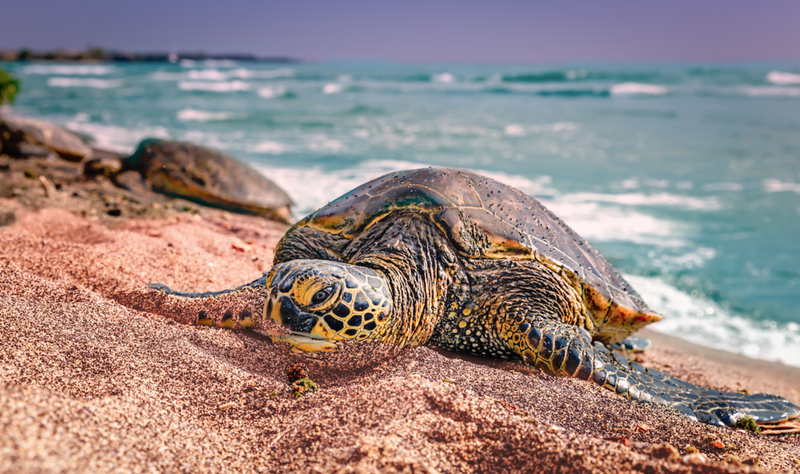 Turtles can show up as a person’s guardian spirit, known as “Aumakua.” When lost, turtles are excellent navigators and often find their way home. Legend states that a green sea turtle guided the first Polynesian settlers to the islands. In historic days, only the rich were allowed to consume turtles as food. In modern times, sea turtles are protected by the Endangered Species act and there are severe penalties just for giving them stinkeye.